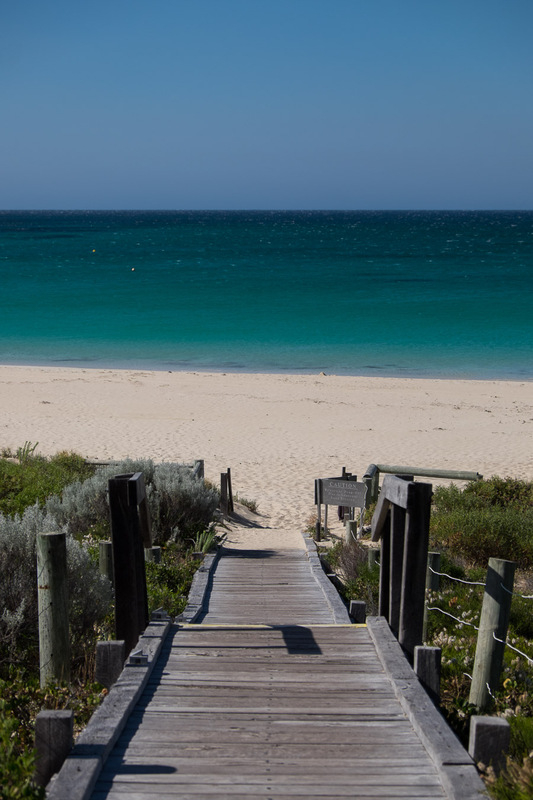 A couple of weekends ago, we had a short getaway in Bunker Bay, which is around 3 hours’ drive south of Perth, in the South West region of Western Australia. We got up early on Saturday morning, packed our overnight bag and made cuppas for the road. Disclaimer upfront: High tea was complimentary; everything else we paid for. 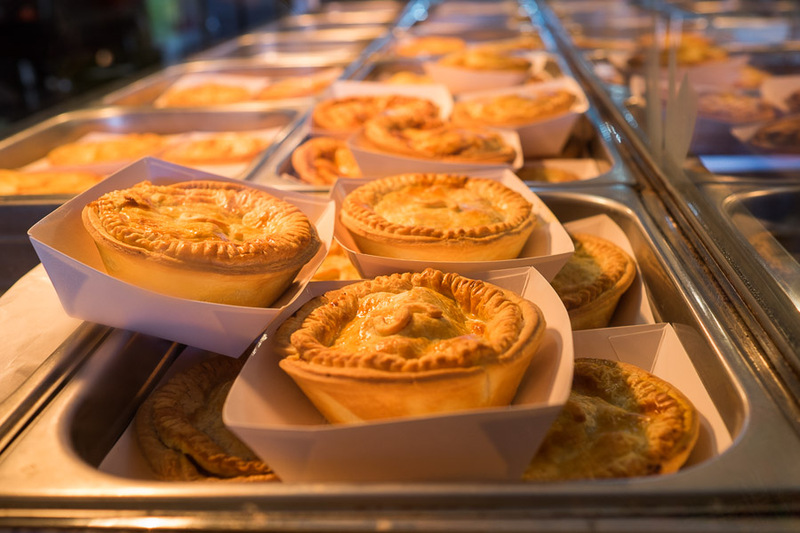 About an hour from Perth, we stopped at the Miami Bakehouse Freeway Pitstop and grabbed a couple of pies. There’s nothing like a hot pie for breakfast. Miami Bakehouse’s roast chicken pies (AU$6.90) are pretty good. I’ve also enjoyed their Cajun chicken and beef and mushroom pies on previous occasions. 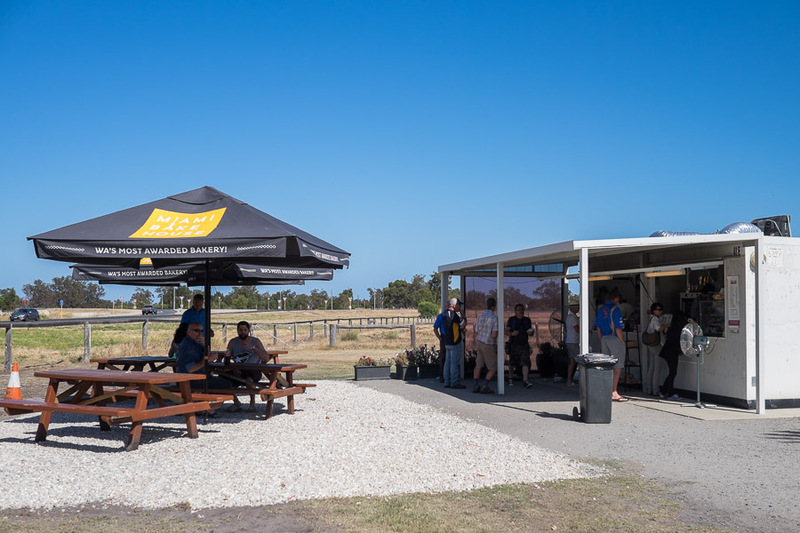 Miami Bakehouse Freeway Pitstop is a popular stop for people driving down south – for hot pies and sausage rolls, coffee and a toilet break. Miami Bakehouse is also in Melville and Falcon (Mandurah). This time around, whoa – the flies were a shocker. We’ve been to Bunker Bay at Christmas years ago and I had forgotten how bad the flies can get in hot weather. 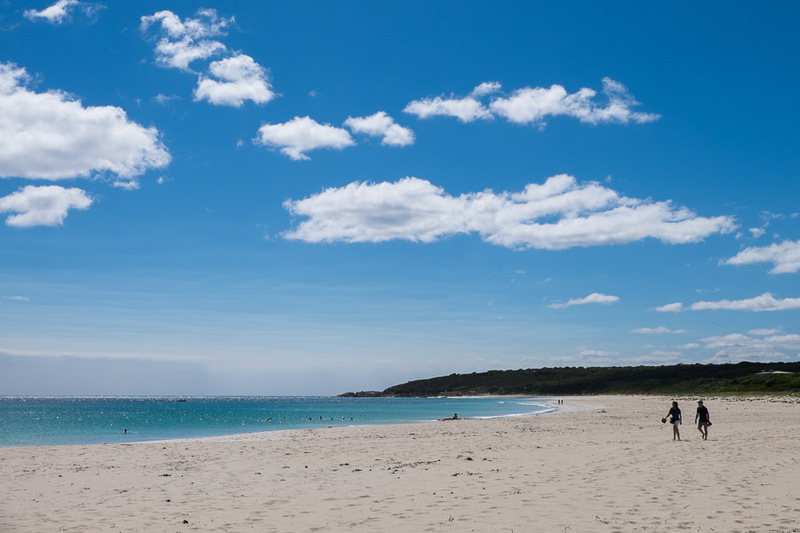 As soon as we stepped out of the car to check out Bunker Bay Beach, we were assaulted by flies. They remained a menace whenever we were outdoors and I inhaled several flies in a single afternoon. Yes, it’s as disgusting as you imagine. Next time I head down south in summer, I’ll wear a fly net hat. High tea is usually at an awkward time in the afternoon, too early to be dinner but late enough to spoil it. We avoided this by booking our high tea at the Pullman Bunker Bay Resort for lunch time, at noon. Ordinarily I’d have loved to sit out on the deck looking out at the ocean, but to my relief, we shown to a fly-free table in the bistro dining room. 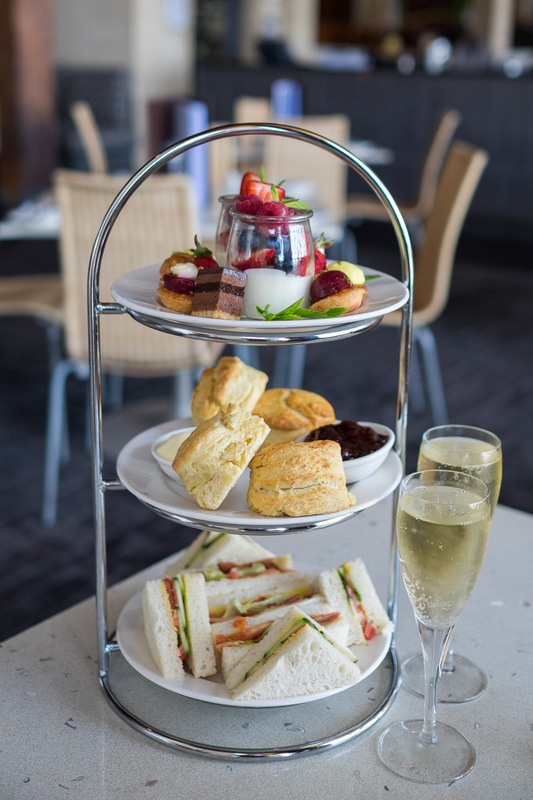 On our three-tiered stand were warm scones with cream and strawberry jam; yoghurt pannacotta with juicy fresh berries and a delectable selection of mini sweet treats; and sandwiches (cucumber, tomato and basil, and BLTs – bacon, lettuce and tomato). We started with glasses of sparkling wine, then pots of tea (green for Jac, English breakfast for me). The sandwich bread was noticeably dry, but the sweets were marvellous. High tea is available until 20 December 2015, daily from 11am to 5pm . Bookings must be made at least 48 hours in advance. A kids’ menu is available for children up to 12 years. 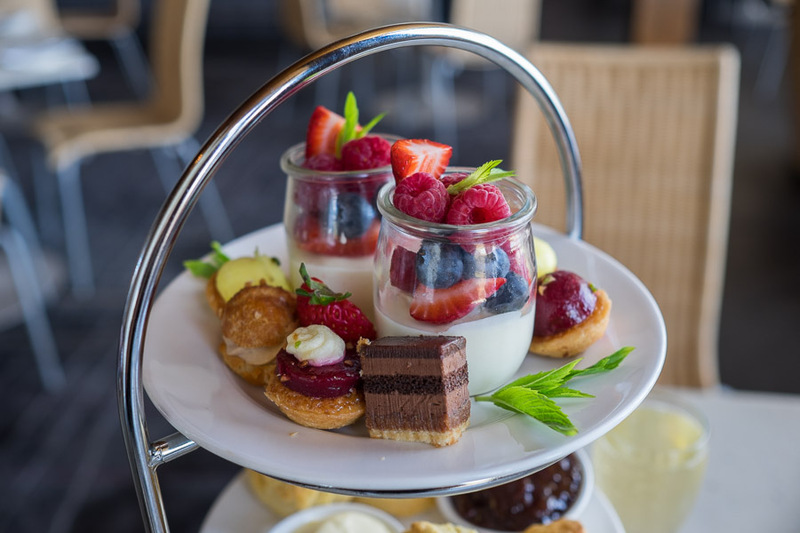 Our high tea was compliments of Pullman Bunker Bay Resort. We checked in at the resort at 3pm. There’s plenty of parking but not at the villas themselves. Our villa was located within easy walking distance to the car park; but for guests whose villas are further away, the concierge offers a buggy porter service to transport luggage to/from your vehicle. Our King Studio Villa was very spacious for a studio, with a king size bed; kitchenette; large bathroom with separate shower and bathtub; fluffy bathrobes and slippers; two flat-screen TVs (one to watch from the couch, the other to watch in bed); DVD and CD player; and iPod/iPad docking station (though they should consider upgrading to support newer devices that use the lightning connector). Wifi is free in the Connectivity Lounge next to reception, but a fee applies if you access it in your villa. The kitchenette was pretty well equipped, with tea/coffee, crockery and cutlery, fridge, microwave, kettle, toaster, mini hot plate and dishwasher, so you can self-cater if you’d like a break from dining out. Mini bar items can be ordered for your room, but we preferred to grab our own drinks and snacks from the shops at Dunsborough town centre on our way in. A bucket of ice was delivered to our room upon our request. 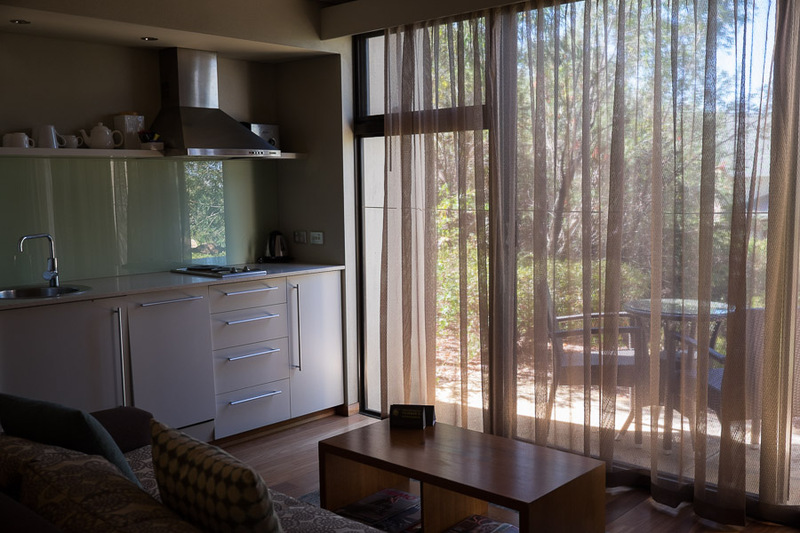 Each studio villa has a private courtyard with either a garden view (as we did) or lake view. 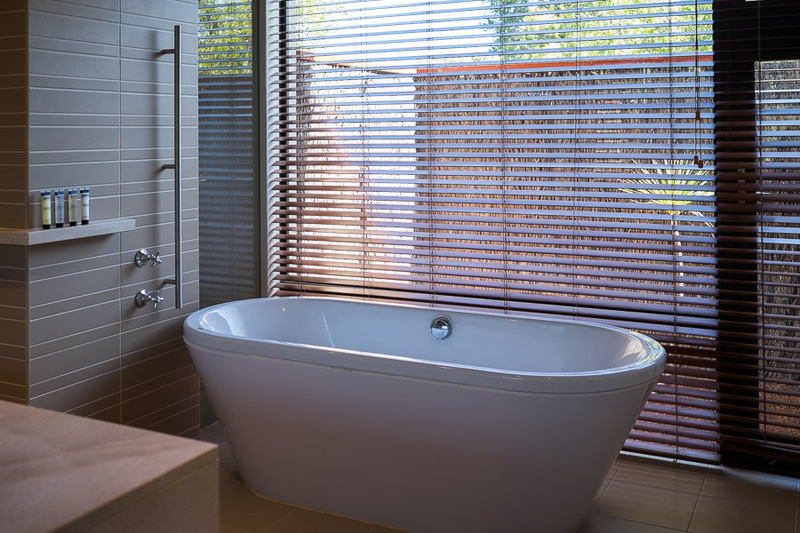 We were impressed with the way the villas are laid out to facilitate privacy and quiet. The car park was full, but we barely heard any noise from other neighbouring guests. 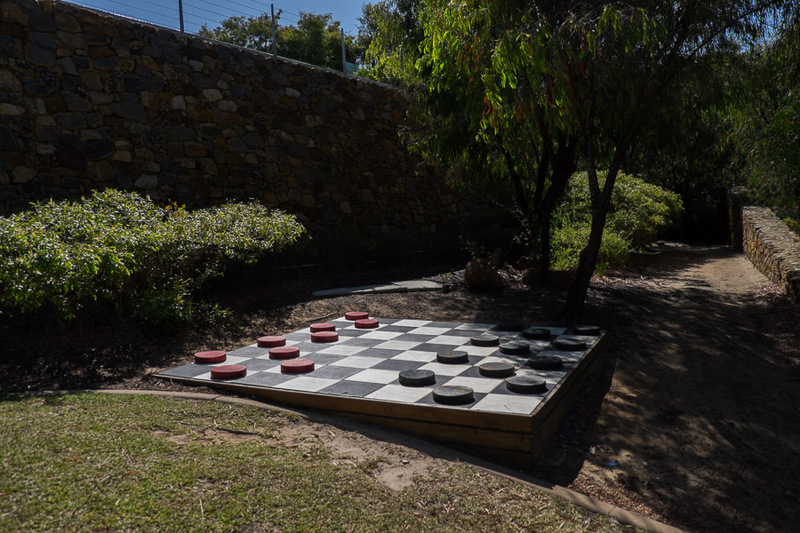 We explored the resort grounds and found a four-burner barbecue, outdoor checkerboard and connect four game which guests are free to use. Barbecues are located on the lower and upper lawn areas. It’s a lovely walk along the resort’s boardwalk past the lake to get to the beach. 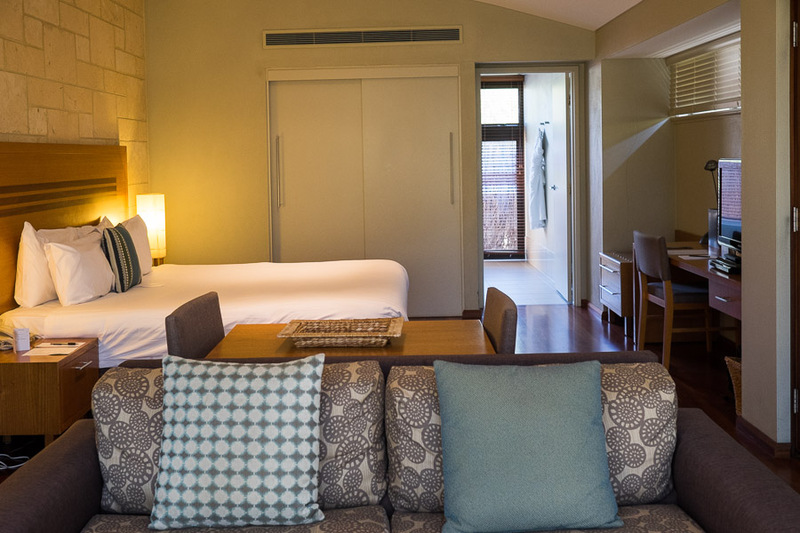 The boardwalk takes you right to Bunker Bay Beach. 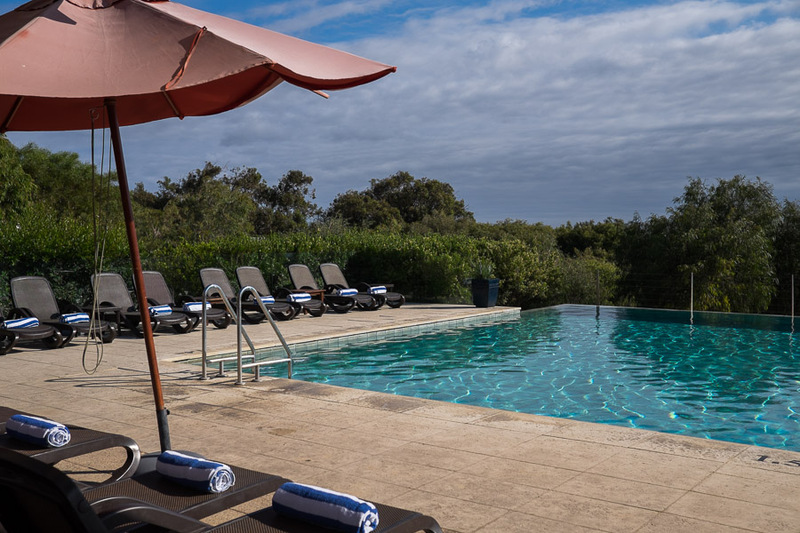 The resort also has a 25-metre infinity pool which is heated to 26C and open during daylight hours. During peak season, the Pool Bar is open for poolside drink and snack service. The gym is next to the pool and open 24 hours. At check-in, we were advised reservations are required for dinner at the resort’s Other Side of the Moon restaurant, while we were free to dine at the Bistro and Bar without a booking. 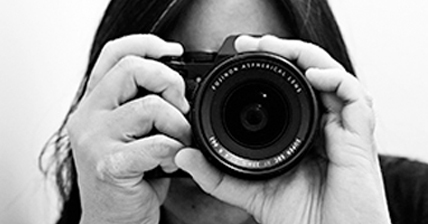 After a walk on the beach and a couple of cold drinks back in our villa, exhaustion from our busy work week finally sank in – and the thought of sitting through the formality of a restaurant meal (or even a more casual bistro feed) was not appealing. It was fantastic to have another option – room service from the Villa Catering Menu. We ordered a light dinner consisting of a local tasting plate (AU$18) and Caesar salad (AU$16). It was perfect for a lazy night in, just relaxing and watching the Food Network on TV. After dinner, chocolate biccies purchased from the supermarket, with cups of tea – two old farts going wild on a weekend getaway! 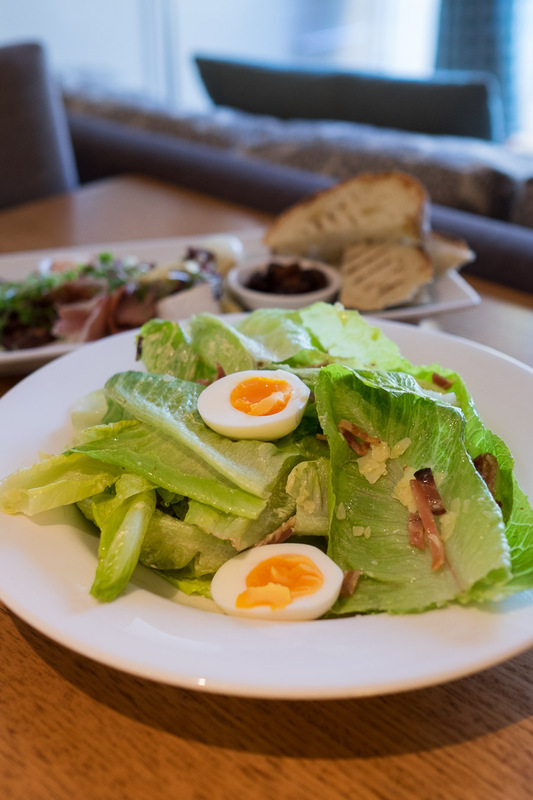 Caesar salad (AU$16) – with crisp baby cos lettuce, pancetta, parmesan, boiled egg, and smoked Caesar dressing. This was a very good rendition of Caesar salad, though we missed the croutons. 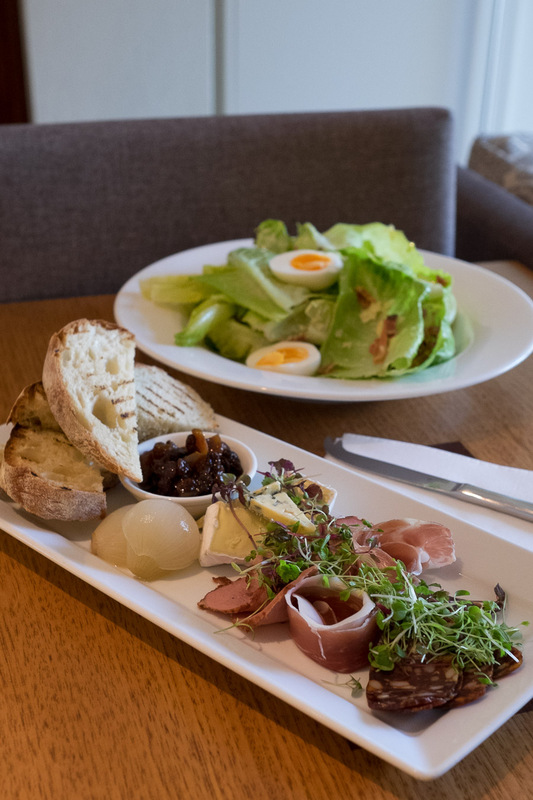 Local tasting plate (AU$18) – venison chorizo, pastrami, local cheese, grilled Yallingup bread, chutney and pickled onions. We enjoyed our stay, brief though it was. The staff we encountered at reception, the bistro and room service were terrific, and our villa was well appointed and comfortable. At check-out, we received a couple of freshly baked brownies as a surprise parting gift. 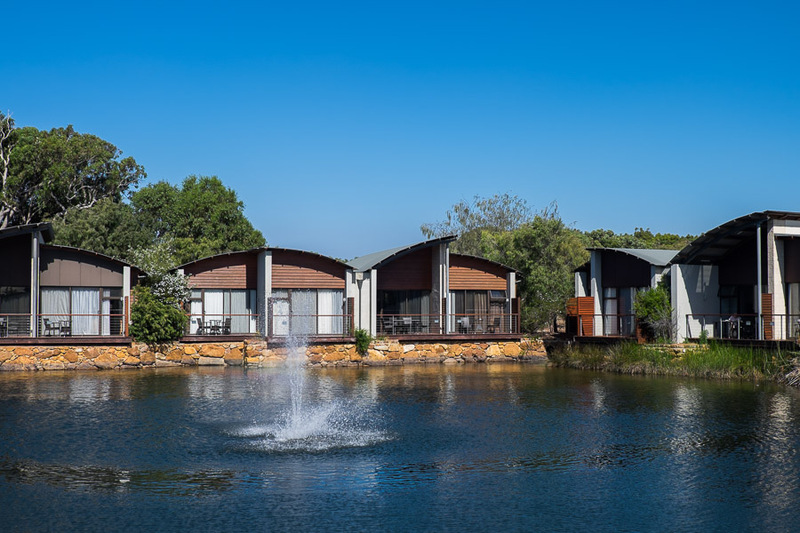 For stays of a week or more down south, we’d probably prefer to rent a house right by the beach rather than book a resort or hotel; but for shorter stays such as indulgent weekend getaways, the Pullman Bunker Bay Resort will be a worthy option. 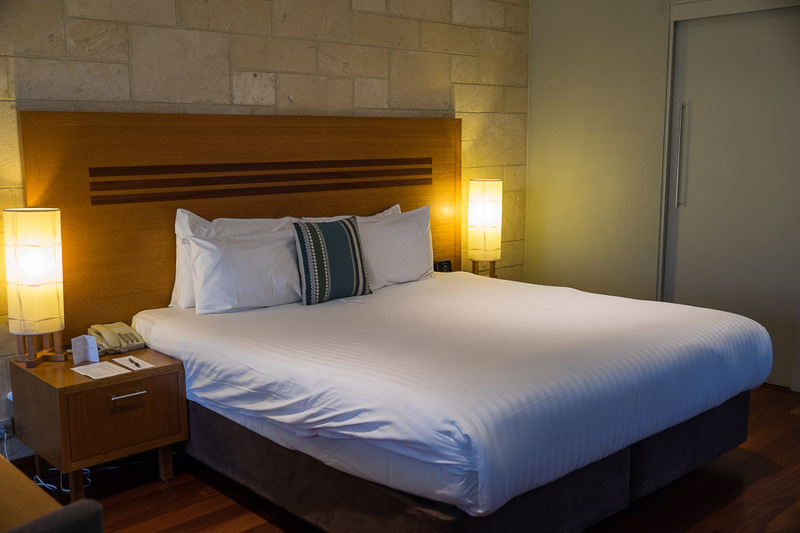 We paid for our one night’s accommodation (AU$299) and room service dinner. 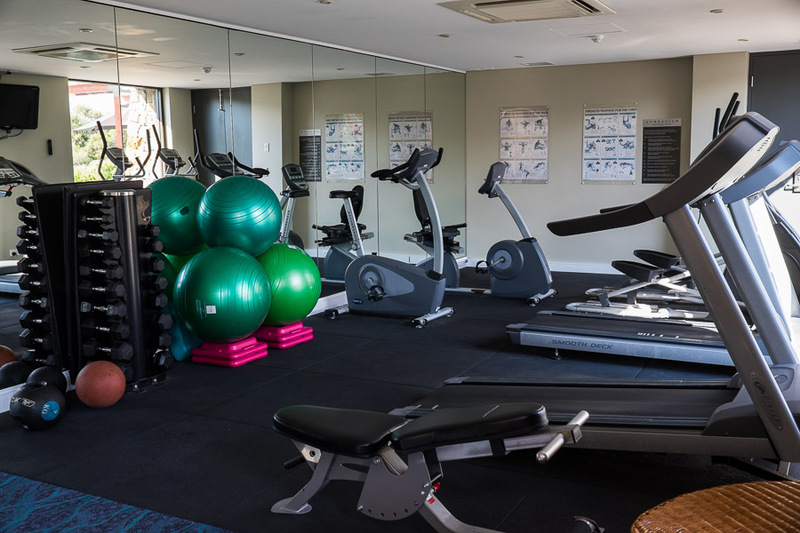 At this point, I’ll also mention the customer service was notably excellent at previous Pullman stays in Auckland, New Zealand and Kuching, Malaysia. On Sunday morning, we didn’t have breakfast at the resort but went to Bunkers Beach Cafe via a walk on the beach. We knew the cafe is extremely popular and deliberately got there at opening time to beat the crowd. We weren’t the only people waiting at the front door; there were several group bookings and only a couple of free tables for two left inside. We’d have chosen a table outside on the deck but sat inside to avoid the flies. This proved to be a wise choice – the entire time we were there, we couldn’t help noticing the people sitting out on the deck repeatedly swatting and waving. I’d been to Bunkers Beach Cafe before; Jac had not. 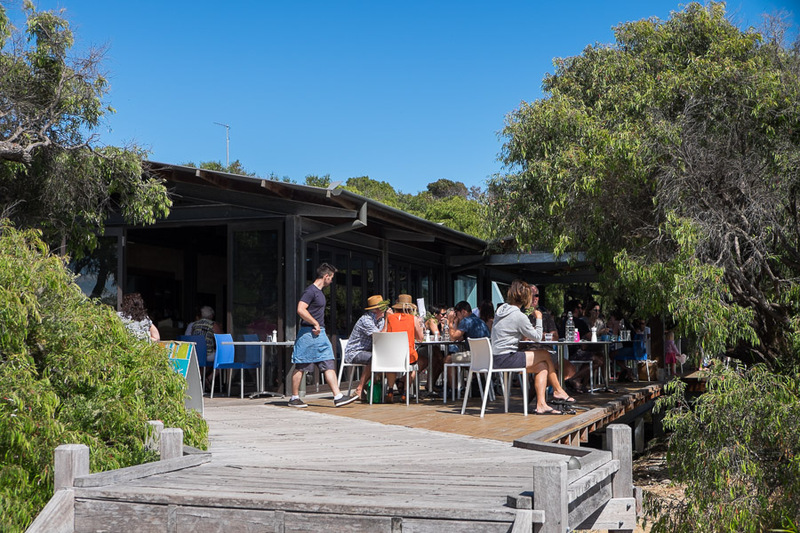 It certainly is a beautiful setting – the cafe is in a prime location right on a gorgeous stretch of beach with stunning views of the pristine blue water. But they initially brought me an entirely different dish to what I’d ordered and got our side dishes wrong, so we had to wait while they re-made our order. Jac’s baked eggs were too well done for her liking (this is always a risk with baked eggs, which is why I rarely order them), and anchovy was the overwhelming flavour – in this case, I think it was a case of choosing the wrong dish. My savoury waffle with black bean, chorizo and chipotle salsa, fried egg and avocado sounded great, and all the elements were individually delicious – but eaten together, much too dry, even with the soft egg yolk and avocado. Overall, we didn’t have the best experience, which was a shame. 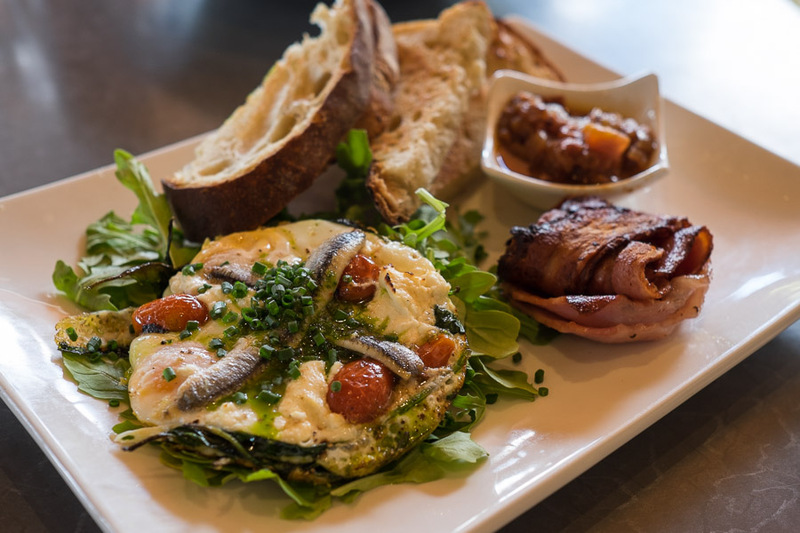 Baked eggs with cherry tomato, chevre, white anchovy & sourdough, salsa verde & tomato relish (AU$18.50) with a side of bacon (AU$4.50). 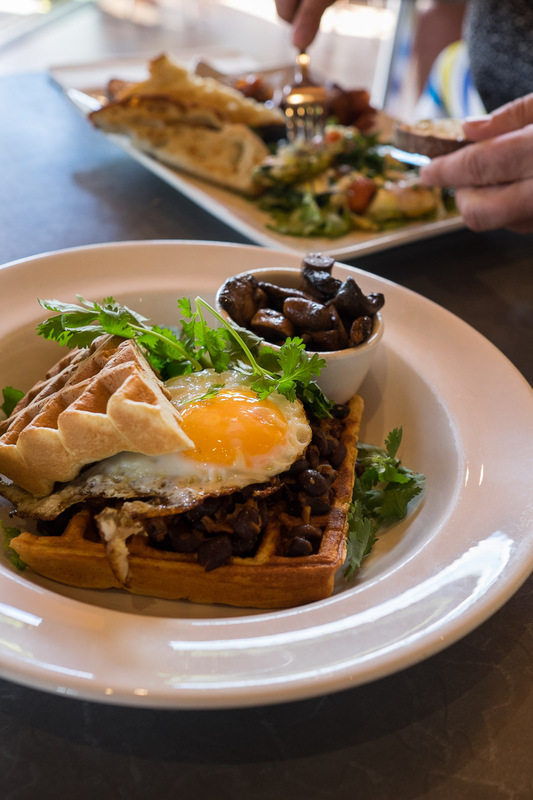 Savoury waffle topped with black bean, chorizo & chipotle salsa, fried egg & avocado (AU$19). I ordered a side of pan-fried mushrooms (AU$4.50). 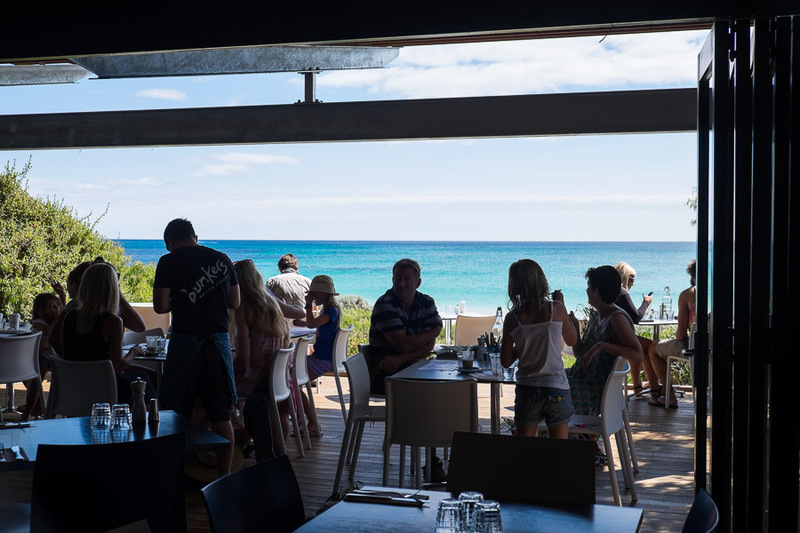 You can walk right off Bunker Bay Beach onto the cafe. 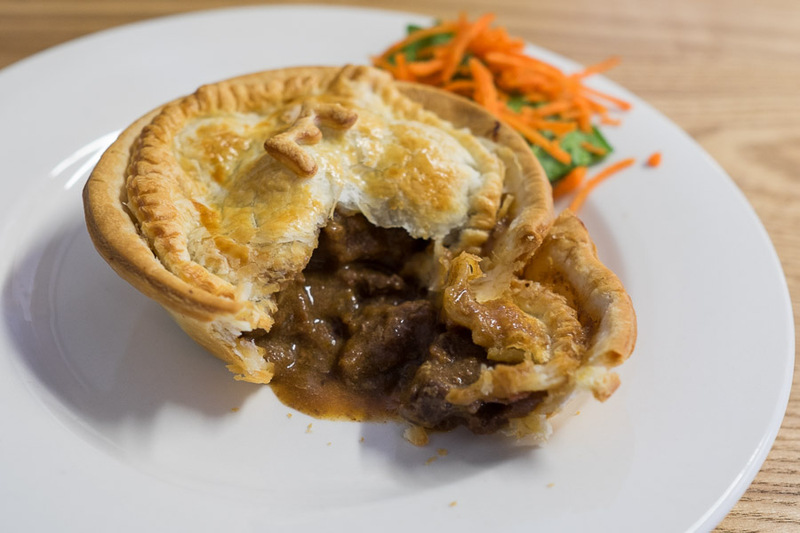 Most people who’ve done the drive down south would have seen the ‘Emu pies’ sign on the left side of Forrest Highway in Myalup, around 1.5 hours from Perth – many of you will have even stopped for an emu pie. 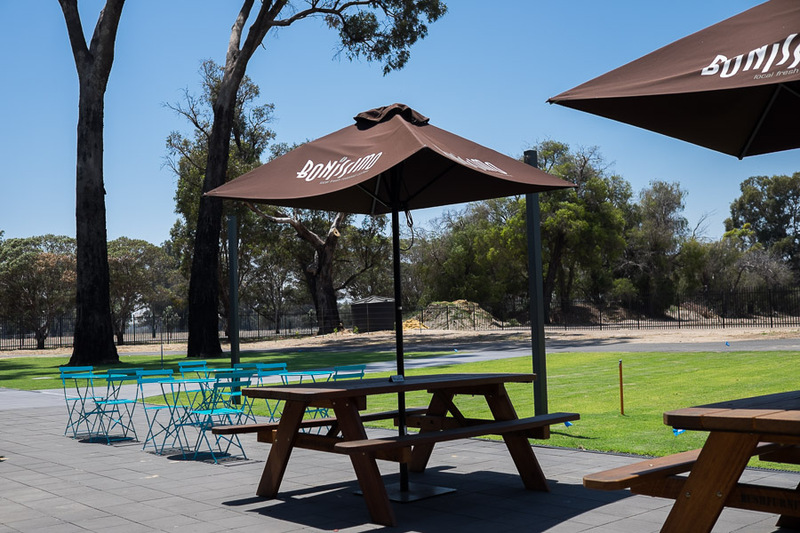 For over 40 years, the family-run business sold emu pies and fruit from their family orchard in Harvey, but the roadside emu pie shop closed down at the end of June, replaced by the colourful Crooked Carrot Cafe, which opened its doors with new owners in August. It’s always sad to farewell an icon and I regret never stopping at the original emu pie shop, but The Crooked Carrot looks to be a wonderful pit stop, carrying on the tradition of selling fruit and emu pies – although I note there is no longer a roadside ’emu pies’ sign. 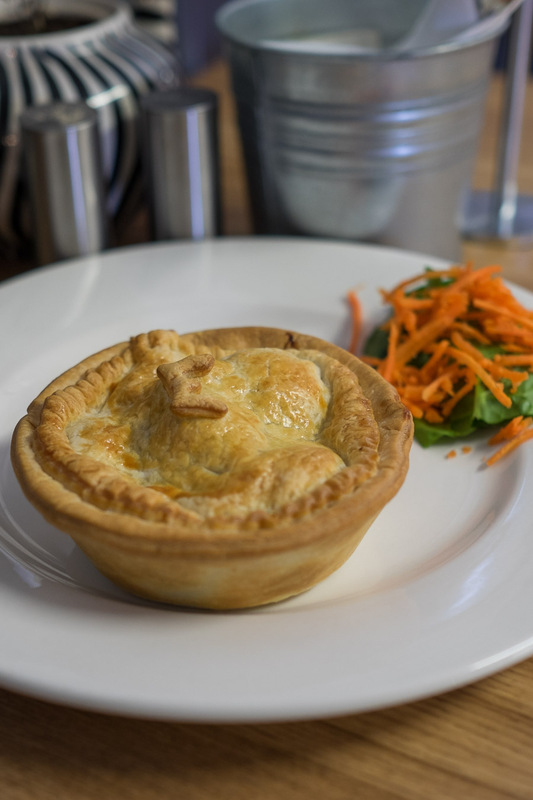 On our visit, pies fresh out of the oven included steak in red wine, Moroccan lamb, chicken and leek, and emu in red wine jus, all made in-house. 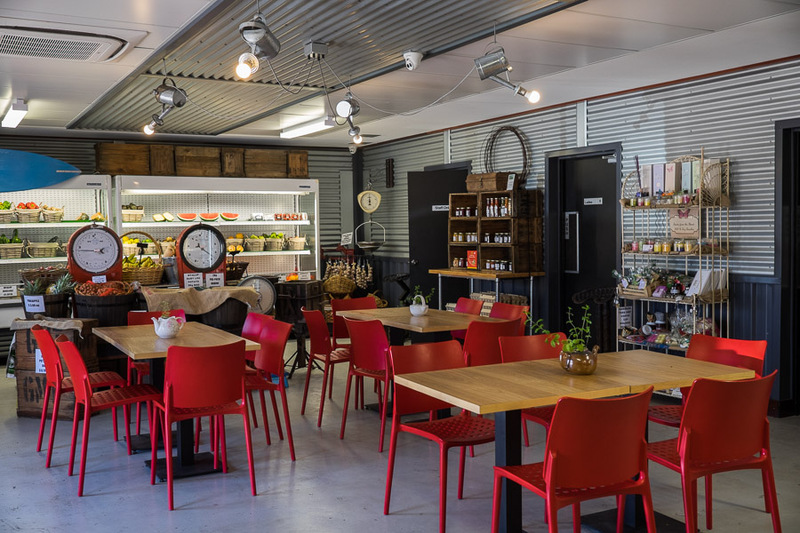 There’s fresh fruit and vegetables and free range eggs sourced from local farmers; locally made jams, relishes and pickles; coffee and freshly cooked meals. The sausage rolls looked great, and on the menu is more road trip fuel: burgers and sandwiches, hand-cut potato chips and sweet potato fries, bacon and egg rolls. For sweet tooths, there’s gelato (by Il Gelato), house-made cheesecake and brownies. Our getaway started with pies and ended with pies. I should stop referring to ‘pit stops’ and just call them ‘pie stops’. A little pastry letter on top of each pie indicates the filling inside – S for steak, C for chicken, L for lamb, E for emu. There were no K pies that day, but if you spot any of those, K is for kangaroo. Emu pie. Next time we’ll order chips too. Emu pie innards. The gravy was tasty but quite runny. Tender chunks of meat, buttery pastry. 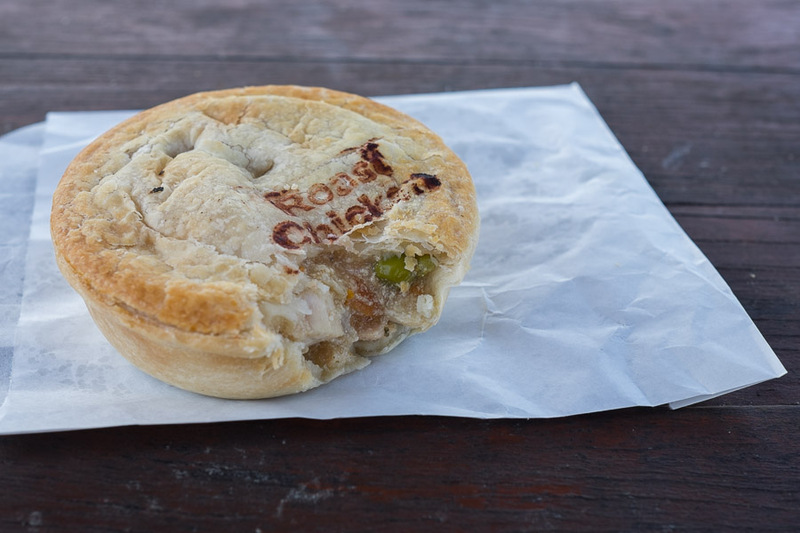 Now that I’ve tasted one of these you can bet I’ll plan another emu pie stop next time we head down south. 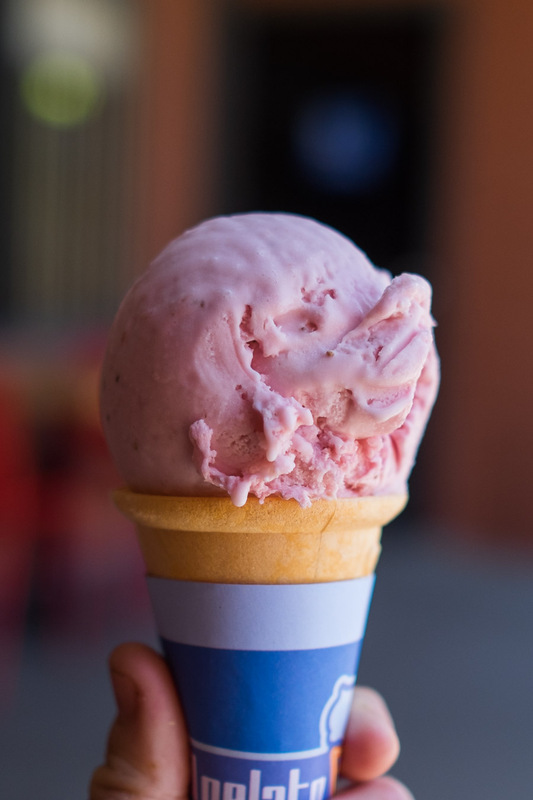 My strawberry gelato in a wafer cone (AU$4). Waffle cones are available for an extra AU$1.20. 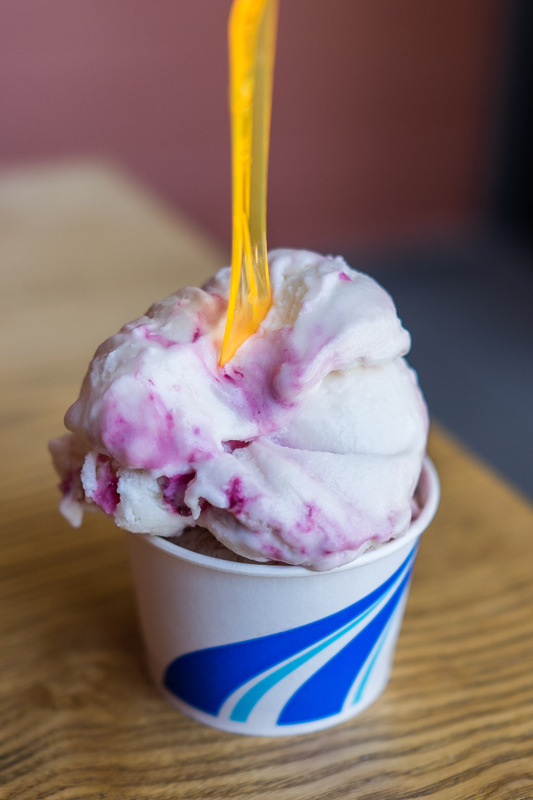 Jac’s black cherry and Ferrero gelato (US$5 for two scoops in a cup). There’s outdoor seating as well. 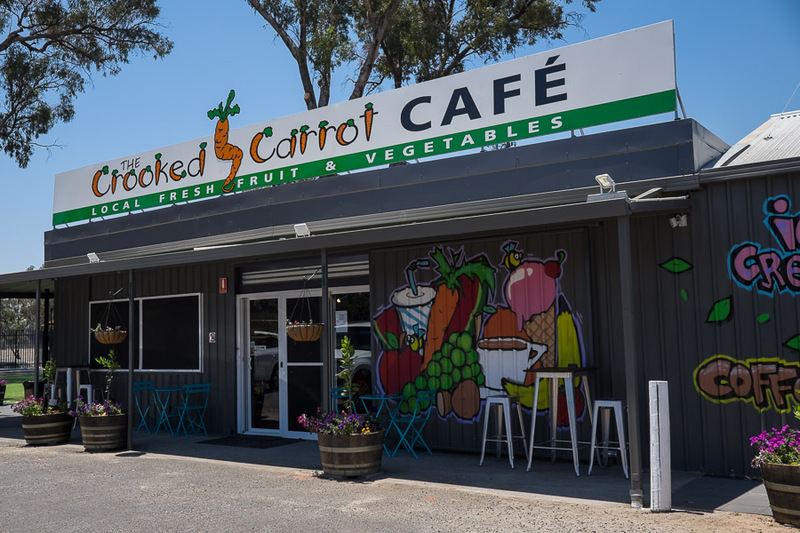 Food and drinks, locally grown fruit and veg, friendly staff – and, always important for those long drives down south, clean toilets.